I told you I was trying new things this year. And this just so happens to be one of them. When Smile Brilliant reached out to me again to give their new cariPRO Ultrasonic electric toothbrush a try and then also the opportunity to tell you guys about it in my own words, I couldn't pass it up. You see, an electric toothbrush is one of the things I was planning on getting for myself this year anyway. Actually for the whole family. I had heard that they were just better. You may remember me bragging about their teeth whitening kit a while back, you can read more about that [here]. I'm no expert when it comes to wellness but I like to think that in the last year or so I've become somewhat of an advocate if you will. I've also become pretty adamant about staying on this "good for your health" road for the sake of myself and my family's well being. And it has been working, we're pretty healthy around here. I love that it just comes naturally for all of us now, everyone has become so flexible when it comes to making changes for the better. Who knew that brushing your teeth could actually be fun? You see I've never ever had an electric toothbrush. I know, right, where have I been?!! I was doing a good job of brushing my teeth before, but my teeth feel even cleaner and look even brighter now after using this toothbrush. If you don't already use an electric toothbrush, I definitely recommend this one. If you do already actually use an electric toothbrush then you're way ahead of me and it might also be time for an upgrade! I cannot wait to purchase these for everyone else now that I know my family will benefit from having one. I don't believe in cutting corners when it comes to wellness and good health especially oral health. With that being said, I'm always excited to share a discount code with you guys. Anytime you're given the opportunity to gain something from me when I review a product, its honestly the best feeling because you guys love a good steal as much as I do! 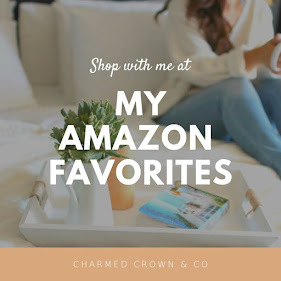 Smile Brilliant is generous enough to offer my readers a 20% off cariPRO Ultrasonic electric toothbrushes, all you have to do is use code: charmedcrownblog20 at checkout! cariPRO Ultrasonic electric toothbrushes for yourself?!! For more answers to some FAQs about Smile Brilliant’s products, click here. Full Disclosure: As always this blog post indicates that I received the cariPRO toothbrush from Smile Brilliant for free in exchange for review! All opinions, however, remain my own. As well, any links are affiliate links which means, I get a small percentage for every sale that occurs through those links. If you want to try the cariPRO toothbrush or the teeth whitening kit, both of which I absolutely love, please consider using my affiliate link and discount code! It helps me keep things moving here at Charmed Crown & Co and every bit goes towards our home!